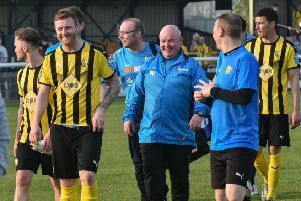 Leamington manager Paul Holleran says the Conference North relegation scrap is building up to be the most competitive yet but is confident his side will survive. Vauxhall Motors’ resignation last season meant only two sides fell through the trapdoor. However, despite Hyde being cut adrift at the bottom with 12 points this term, the next eight sides are separated by just six points and Holleran believes there will be some high-profile casualties. “Everyone wants to stop in it this year,” said Holleran. “Even Hyde believe they’ve still got a chance with the reappointment of Gary Lowe and Martyn Booty and it should be really interesting. “Two or three good sides are going to go through the trapdoor - when you look at Harrogate Town, the mind boggles, they were expected to be up there this season. Brakes face a stern test of their survival credentials tomorrow when in-form Tamworth visit the New Windmill. After an indifferent start to the season, a ten-game winning run has catapulted them up to fourth in the table and Holleran admitted they have finally found the right blend for success. “I’ve seen two or three of their games recently and they’re a typical good Conference North side, well organised with two or three match-winners. “It’s what we are in this league for. The game’s got a bit of locality, they should bring some big numbers and it promises to be a good atmosphere. Brakes go into tomorrow’s game on the back of a 2-1 defeat to Birmingham City in a Birmingham Senior Cup match which saw loanee James Fry line up for the Blues. The late denial of a spot-kick when James Husband was brought down in the box angered the home side at the time, but Holleran accepted the cup exit might prove to be in the club’s best interests. “Look, I’d have loved to have gone through, but staying in the Conference North has to be our main concern and we can now concentrate solely on that. “Birmingham came with a strong side, with (Olly) Lee, Amari’i Bell and (Nick) Townsend all playing, but it was spoilt by the wind. In my five or six years here it’s the worst night we’ve had. “Despite that, it was a decent game in the second half when the teams got more used to the conditions and we got in two or three decent positions. “And you could have been standing in Leamington town centre and known it was a penalty for the challenge on Jimmy (Husband).  Brakes are close to finalising a short-term loan to cover for the loss of Jamie Tank (hip) for the next three games, with a Conference Premier centre-back having been targeted.  With a large attendance anticipated for tomorrow’s visit of high-flying Tamworth, Leamington are asking supporters of both sides to help with travel and parking by using the free ‘Park N Ride’ bus service, car sharing or using the Brakes Trust mini-bus service.